How are you? I am currently completing a distant learning marketing course and was practicing previous exams. I am having trouble completing the following questions. I have looked on the internet and got an idea of what they mean and do but I just need an example for each of the questions to get an idea of how I would answer them. You should assume the the Variable Costs amount is proportional to the number of hats sold, i.e., \$5 multiplied by number of hats sold. You should also assume that the amounts tabulated are annual. Now it's easy to show that selling 800 hats per year creates Sales Revenue of \$16,000 and Variable Costs of \$4,000. As the annual Fixed Costs amount is \$12,000, the company breaks even by selling 800 hats per year. Each additional hat sold per year increases annual profit by \$20 - \$5 = \$15. You need to divide \$25,000 by \$15 and round up the result to be an integer. Can you now do the third question? Can you attempt the remaining questions? For information about elasticity of demand, you could read this article. thank you so much!! I understand 1,2 and 3 perfectly now. Now I am having trouble with number 4. 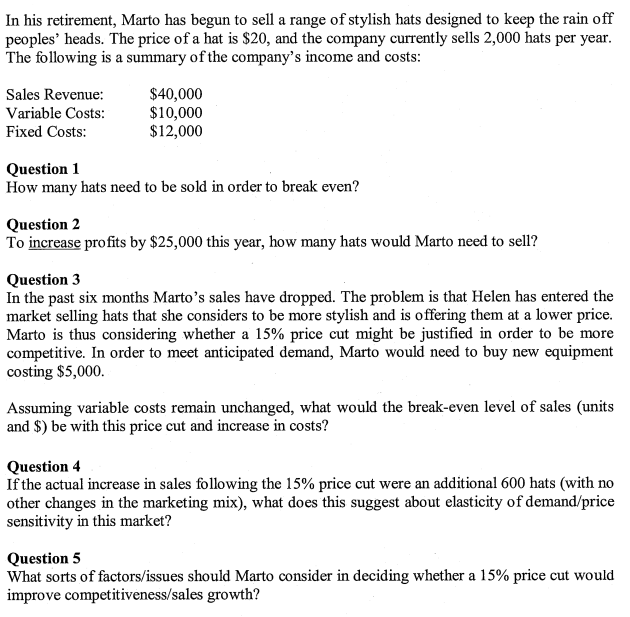 For Question 4, I think you're intended to conclude that an extra 600 hats would be considerably more than 15%, so there is considerable elasticity. Putting it another way, the demand is very price-sensitive. For question 5, you need to be imaginative. For example, would Helen cut prices after a short while as well? Which is more important to Marto - profits or market share? Can Marto drive Helen out of business? Thank you, I also learnt.